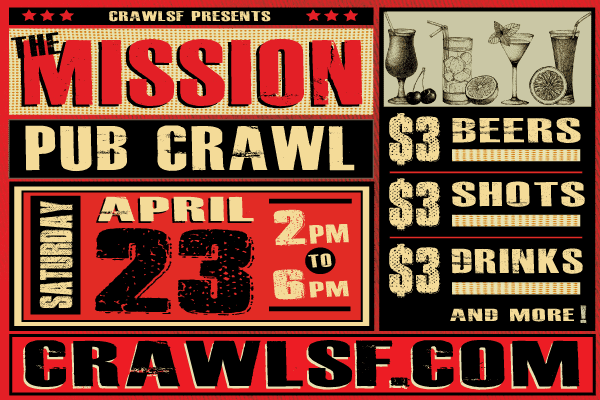 Enjoy day drinking at it’s finest with the CrawlSF Mission District Pub Crawl. With so many great bars and restaurants, The Mission is the perfect place to discover some hidden gems and enjoy some cheap drinks with your friends. The Pub Crawl will run from 2PM to 6PM on Saturday, April 23. Each bar will have awesome beer, shot and cocktail specials for only $3! The Pub Crawl will start at Skylark (16th @ Valencia). You can check in anytime between 2PM and 4:30PM.